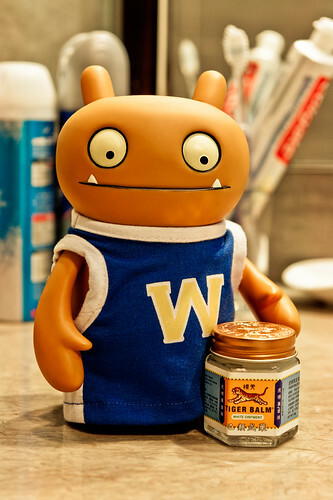 Uglyworld #1631 - Magicals Balm - (Project TW - Image 213-366), a photo by www.bazpics.com on Flickr. If you sufferers from those annoyerings little mosquitos who likes to munchers on peoples whenever they cans, then I has the perfecters mediciner for you to uses on your biters. Checkers it out, it's callereds Tiger balms, and it's some kinds of weird and wonderfullers mixture of herbs and extracters, and how knows, maybies also pieces of real tigers too! Baz says it's the bestesters stuff to uses on insecter bites, so I always makes sure I knows where it is just incase the little buggerers decides to has a muncher on me insteads of Baz for a change.